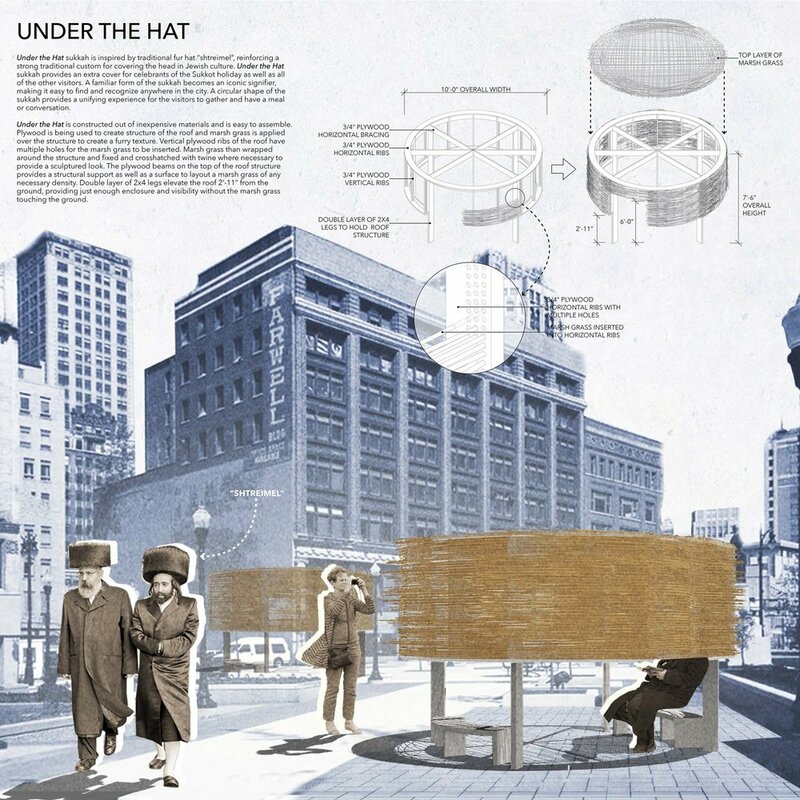 Under the Hat sukkah is inspired by traditional fur hat “shtreimel”, reinforcing a strong traditional custom for covering the head in Jewish culture. Under the Hat sukkah provides an extra cover for celebrants of the Sukkot holiday as well as all of the other visitors.A familiar form of the sukkah becomes an iconic signifier, making it easy to find and recognize anywhere in the city.A circular shape of the sukkah provides a unifying experience for the visitors to gather and have a meal or conversation. Under the Hat is constructed out of inexpensive materials and is easy to assemble. Plywood is being used to create structure of the roof and marsh grass is applied over the structure to create a furry texture. Vertical plywood ribs of the roof have multiple holes for the marsh grass to be inserted. Marsh grass than wrapped around the structure and fixed and crosshatched with twine where necessary to provide a sculptured look. The plywood beams on the top of the roof structure provides a structural support as well as a surface to layout a marsh grass of any necessary density.Double layer of 2x4 legs elevate the roof 2’-11” from the ground, providing just enough enclosure and visibility without the marsh grass touching the ground.